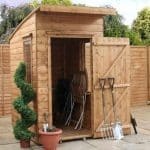 The Standard Overlap Mower Shed offers an excellent storage solution for your lawnmower and other garden equipment and accessories. 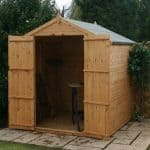 The 4x3ft dimensions are ideal for the smaller garden or as a secondary storage building within a larger one. This 4.8 x 3.1 overlap shed has wider opening double doors to allow you full access to the entire space inside the unit. The cladding is sourced from Baltic pine. This is some of the toughest wood in the world, and especially grown at a slower rate to ensure it is denser and more durable than standard timber. There are no windows in the design either, so it protects the contents of the unit from any prying eyes. The mower is safe in this building, and the double doors allow excellent access, and with a 10-year anti-rot guarantee it is a perfect unit for your lawnmower. With a pad-bolt making the double doors lockable, your outdoor and garden equipment will be kept safe and secure whilst not in use. This is an ideal feature if you are storing expensive tools and equipment, whilst giving you peace of mind. 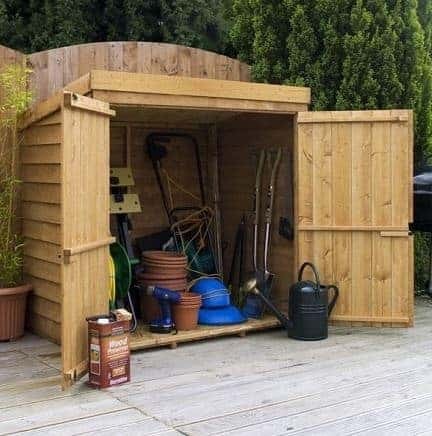 The mower shed is an excellent example of a building designed to meet a specific need or purpose within a garden; in this case to store a lawnmower neatly away. In this section we will discuss how the overlap shed can meet your needs and different uses it may serve. We will also have a look in further detail at the different aspects and features that the shed has to offer you and your garden. Exterior: The shed exterior has a traditional wooden shed appearance, constructed from Baltic sourced pine with 8mm cladding. The 10-year anti-rot guarantee provided by the manufacturer gives you peace of mind that the shed will withstand the elements for many years to come. Interior: The shed interior is an excellent space in which to store your lawnmower as well as other garden and outdoor equipment. Measuring at 4x3ft, it is ideal for the smaller garden or even as secondary storage. Doors: The doors are large in proportion to the shed as a whole, measuring at 4’4”. They provide a fantastic overview of the complete contents of the shed and allow you to store and retrieve items with ease. Security: The shed comes complete with a pad-bolt security fitting, onto which a padlock may be attached to allow your items to remain secure whilst not in use. 4’8” x 3’1” Standard Overlap Mower Shed: How easy to build? The Mower Shed will arrive directly to your door in a flat-packed package containing all of the timber panels, roofing, fixtures and fittings that are required for assembly. Although, due to the smaller size of the shed, it would be possible for an individual to assemble the building, it is recommended that two people work together for safety reasons. Step-by-step instructions are included to keep you on track and make it a straight-forward assembly process for those with limited DIY experience. A home installation service is available at an extra cost should you wish to take advantage of this service. 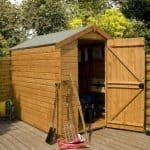 4’8” x 3’1” Standard Overlap Mower Shed: What is the overall quality like? The overlap shed is built like a traditional wooden shed, from high quality Baltic pine timber and 8mm overlap cladding. Both the high density timber and rigid cladding contribute to the strength of the structure, making it sturdy and protecting equipment inside from the elements. 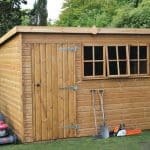 If the shed is kept well maintained then it will carry a 10-year anti-rot guarantee from the manufacturer, ensuring a long and productive life within your garden. The windowless design and lockable double doors ensure that the shed is secure. We love the natural timber appearance of the mower shed as it blends into its natural surroundings effortlessly – however, wood treatments are available at no extra cost and in a range of colours. 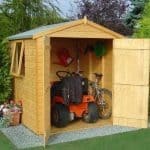 The Standard Overlap Mower Shed is the ideal storage solution for lawnmowers and garden equipment to be neatly stored away. 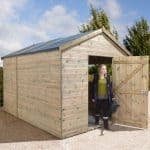 Smaller than the average garden shed, this attractive shed allows you to organise your equipment, with the advantage of easy accessibility through the wide doors. Complete with a pad-bolt, you can have peace of mind that your equipment can be stored securely whilst not in use. At this amazing price, we’re sure that you can find a use for the mower shed within your garden!